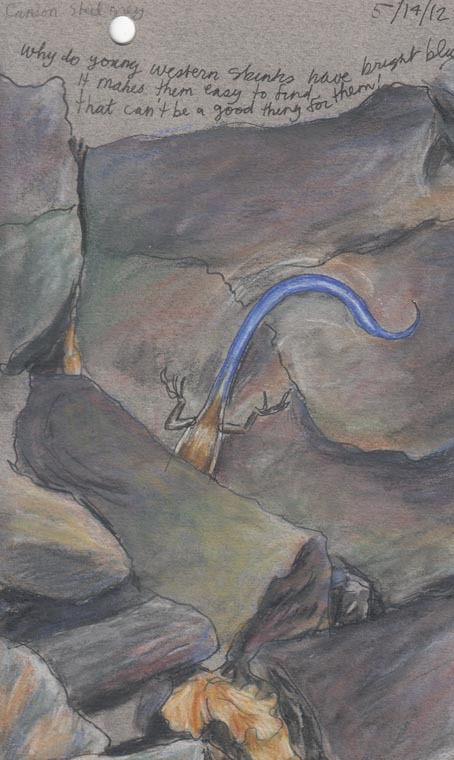 Just Around the Corner: Why do Western skinks have bright blue tails? Your posts are so much fun to read! 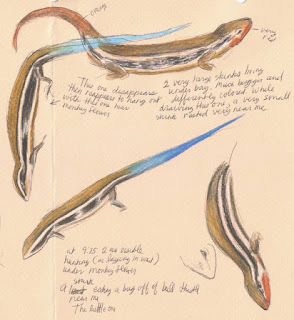 I like the skinks (love that name) slinking around the drawings. I especially like the last one! Very good work! Thank you Katherine. Skinks Slinking sounds like a good name for a rock band. Very nice drawings. It's not just your western skinks that have blue tails, lots of American skinks have blue tails, especially while young. One of our local species even has a bright pink tail that turns more coppery-orange as an adulthood. 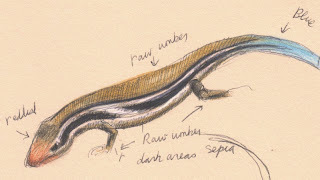 You may notice the blue tails appears black in low light situations, where skinks spend most of their lives skulking about in search of insects. So, the blue color is not a liability in the shadows, only when they must move out of cover and across an exposed gap. I have seen a few skinks that appeared to be basking a bit, but it was very brief, a minute or so and not nearly as much as far as I have seen other lizards bask. I have to go with the consensus, after autotomy of the tail (breaking away at its brittle connection point), the bright blue tail trashing on the ground creates a distraction that may allow the skink a moment, all it usually needs to escape back into the leaf litter, under tree bark, or beneath a nearby stone. 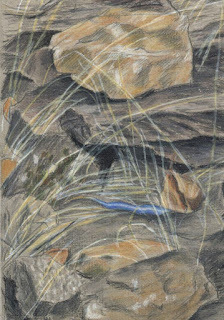 I have watched, more than once, as a fascinated cat played with a skink's still twitching tail for a minute or more - with no visible sign of the rest of the lizard. But, I will throw out yet another option to consider. I have heard the following story many times, about dogs or cats known by their owners to routinely catch and eat lizards (our current Labrador catches and "plays" with geckos). In each instance, a pet barfed up a blue-tail, or a lizard with a blue tail, or a lizard AND a blue tail. Could it be that skinks are noxious? I have never heard of that with a reptile. But, why don't the pet-owners find barfed up anoles and geckos, too? Hmmm. There is a well-known rule of thumb: don't attempt to capture or handle brightly colored wildlife unless you know what it is and how to handle it. Many, probably most, wild animals are camouflaged - their colors match their habitat. Some have cryptic patterns, to break up their outline, like tigers and zebras. red and black "velvet ant" (really a wingless wasp). Insects in particular often display bright colors to advertise that they are noxious, if eaten: monarch butterflies and their caterpillars are a famous example. Naive animals may try one, but they'll remember the experience and avoid testing similar insects in the future. I almost missed these beautiful skinks, Debbie. Gorgeous blue. I spend quite a lot of time just sitting watching the little bright green lizards here.